Is there a prophetic tie between Trump and Cyrus? – Welcome to I Am a Watchman! Is there a prophetic tie between Trump and Cyrus? Is President Trump fulfilling Bible prophecy? In considering whether President Trump is fulfilling prophecy, one must first understand that many Bible prophecies have multiple meanings and fulfillment. For example, the Isaiah 14 prophecy regarding the fall of a prideful ruler refers to both Satan and the sixth century BC King of Babylon. Daniel’s prophecies regarding an evil ruler defiling the Temple, forbidding Temple sacrifices and persecuting God’s people refers to both the second century BC Syrian ruler Antiochus Epiphanies and the Antichrist of the last days. The idea that prophecies can have parallel or multiple fulfillments may not be widely taught in churches today, but the teaching is rarely disputed. Following this thought, some have noted parallels between King Cyrus, leader of the Persian Empire in the sixth century BC, and President Trump. Prophecies concerning Cyrus are found in Isaiah 44-45, and in the writings of Jeremiah, Ezra, and Daniel. Isaiah’s prophecies regarding Cyrus are notable because they are specific. They precede his birth by decades, yet they mention Cyrus by name. They also note how God would use this king to accomplish His purpose, even though Cyrus would not be a Hebrew or strong believer. God would choose him, help him and move him into a position of power and honor (Isaiah 45:1,4). Cyrus would be resisted but would overcome (Isaiah 45:2). Cyrus would be wealthy (Isaiah 45:3). When chosen by the Lord, Cyrus would not be a Hebrew or a believer (Isaiah 45:4). Cyrus would be a protector of God’s people and accomplish God’s purpose (Isaiah 44:28). Cyrus would assist in restoring the city of Jerusalem (Isaiah 44:28; Dan 9:25). Cyrus would set captives free (Isaiah 45:13). Cyrus would assist in restoring Jerusalem’s Temple (Isaiah 44:28; Daniel 9:25). Historians note that secular and biblical sources show that King Cyrus fulfilled all of the prophecies noted above. Prominent passages in Daniel, Ezra, and the book of Nehemiah note how the prophecies were fulfilled. What is the connection to President Trump? President Trump’s amazing presidential win seems supernatural. Against all odds, he moved into a position of world power and honor. President Trump has faced fierce (perhaps unprecedented) resistance from the media, the entertainment community, and key government agencies (such as the DOJ and FBI). Amazingly, President Trump has overcome this opposition and remains in power. President Trump is a person of significant personal wealth. President Trump did not identify as a strong person of faith when he announced his candidacy in 2015. President Trump has been an amazingly strong protector of the unborn and defender of the right to embrace Christian principles. President Trump has increased support to (and improved America’s relationship with) Israel and has led the international movement to recognize Jerusalem as the capital of Israel. Isaiah notes that the restoration of Israel (and the work of Cyrus) would include releasing captives (Isa. 45:13). Ezra 1 records the fulfillment of that prophecy. Some see that that President Trump is fulfilling this prophecy in this way: Many changes took place during the Obama presidency which threatened religious liberty in America. Several Christian clubs, colleges, ministries, businesses, and churches were sued or harassed by government agencies. Many feared it would only be a few years before public expression of Christian values or faith would be deemed hate-speech and unacceptable. Under the guise of ‘intolerance,’ there was a major push to restrain the voice of the Church and restrict the witness of faithful believers. President Trump, however, has introduced bold initiatives and executive orders to advance religious freedom and support Christian values. For example, in October 2017, the Department of Justice issued twenty principles of religious liberty to guide the Administration’s litigation strategy and protect religious freedom. And in January 2018, the Justice Department announced a religious liberty update to the U.S. Attorneys’ Manual, raising the profile of religious liberty cases and directing the designation of a Religious Liberty Point of Contact for all U.S. Attorney’s offices. Also in January 2018, the Department of Health and Human Services (HHS) announced major policy changes protecting freedom of religion inside and outside of the government. It can be argued that President Trump has loosed the chains that were weighing heavy on God’s people. What does Israel think about President Trump and Cyrus? On March 6, 2018, Israel’s Prime Minister, Benjamin Netanyahu publicly acknowledged the striking similarities between President Trump and King Cyrus. 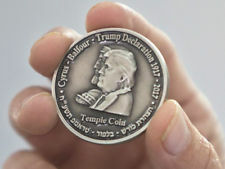 Further, Israel has minted a commemorative Half Shekel, with the images of King Cyrus and President Trump on one side, and the Temple on the other. Israel has high regard for what Cyrus did, and what President Trump is doing. Will President Trump fulfill other Cyrus-related prophecies? If President Trump is indeed destined to fulfill prophecies previously assigned to King Cyrus, then there are two notable prophecies we should look to be fulfilled in the near future. The first is the building of the wall in troublesome times and the second is Trump’s facilitating the building of a new Temple (which implies total Hebrew control of the city of Jerusalem and the Temple Mount area). Daniel 9:25 details the building of the wall. The word wall is translated moat in some translations, and both translations are acceptable. However, the primary connotation of the word wall is symbolic (i.e., complete protection). And as Jerusalem was never completely encompassed by a moat, the Daniel 9 prophecy very likely references the wall profiled in the book of Nehemiah. Thus, a physical wall is the better interpretation if a parallel prophecy is to be fulfilled by President Trump in the future. The building of a wall along the southern border of the United States (for the protection of American citizens and interests), was a principle campaign promise and is currently a hotly debated issue in Congress. President Trump seems to be expending much political capital on the southern border wall project. Many suggest his efforts are not wise or politically correct. However, if President Trump is to fulfill the prophecies associated with Cyrus then the US wall initiative will be completed. Prophecies regarding the complete restoration of Jerusalem, including the building of a Third Temple and resumption of daily sacrifices, are key to any discussion on the events of the last days. Dozens of Old and New Testament prophesies note that before the 7-year Tribulation period begins, Israel will be re-established as a nation and Jerusalem will be its recognized capital. Prophecy also notes that before the mid-point of the Tribulation, a new Temple will be built and the practice of making daily sacrifices in the Temple will be in place. The fulfillment of prophecies regarding the Temple and restoration of Jerusalem set the stage for the fulfillment of “Great Tribulation” period events. Regardless of what role President Trump plays in the fulfillment of prophecy, the calling of every believer is clear. 1 Timothy 2:1-4 directs believers to pray for those “in authority.” I encourage all to pray for those who lead—that they would be kept safe, know and be open to the Lord’s leading, and accomplish God’s purpose. Pray strong Watchmen. Finish Well.